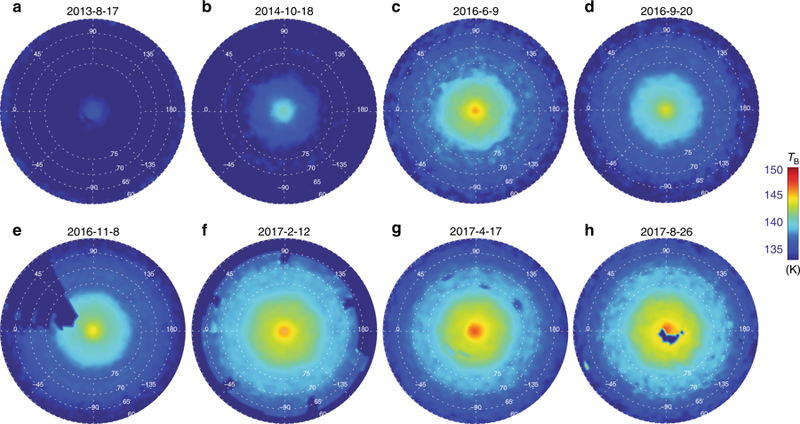 Analysis of data from the Cassini probe has revealed that a vortex towering more than 300 kilometres above Saturn’s north pole mirrors the famous hexagon cloud pattern observed lower in the planet’s atmosphere since 1980. Sandrine Guerlet from the LMD dynamic meteorology laboratory in Paris, who has co-authored a paper on this discovery, explains. The Cassini probe spent 13 years and 76 days orbiting Saturn, the second largest gas giant planet in the solar system, yielding a treasure trove of data. On arrival, it trained its measuring instruments on the gigantic hexagon cloud pattern in the troposphere—the ‘surface’ layer of the atmosphere—at the north pole. First observed by Voyager 1 during its flyby in 1980, this complex feature is hard to view from Earth. While Cassini started taking readings straight away, for some of its instruments the science team had to wait for the right conditions. A case in point was CIRS (Composite InfraRed Spectrometer). “When the probe arrived in situ in 2004, the northern hemisphere and its hexagon were in the midst of winter and the signal was too weak for us to study the middle atmosphere, at altitudes between 200 and 400 kilometres, as it was too cold there for the instrument (–158°C). As the seasons changed (a year on Saturn is 30 Earth years long) and we arrived in spring in 2009, then the start of summer in May 2017, temperatures warmed by about 30°C and the readings from CIRS became increasingly clear,” confirms Sandrine Guerlet. The physics behind the formation of this hexagonal feature in Saturn’s clouds are well known: atmospheric perturbations in the strong jet stream (360 km/h) cause it to meander in a regular pattern. “We’re able to reproduce this structure with our models, except for its great stability over time,” says Sandrine Guerlet. All that remains is to explain the second hexagon above the first. Is it a kind of ‘imprint’ induced by low-altitude winds, a vertical propagation of the waves and energy of the tropospheric jet stream or another phenomenon altogether? Explaining this vortex’s hexagonal shape could also provide fresh insight into phenomena inside the thick cloud layers and how they affect their surrounding environment. What’s certain is that future research will need to develop more-complex models. “Saturn is well suited, its environment is perfect for working on fluid dynamics and currents, for example, as there are no terrain-induced disturbances like on Earth,” explains Sandrine Guerlet. “At the LMD dynamic meteorology laboratory we’re working on these dynamic regimes on the gas giant planets, including on Jupiter thanks to the data from the Juno spacecraft, but each case is unique. There’s no jet stream at Jupiter’s poles, and at Saturn’s south pole there’s no hexagon.” This asymmetry between Saturn’s hemispheres is also found in its stratosphere, where the temperatures in the north were lower than in the south when measured by the Cassini spacecraft that broke up as planned on entering the planet’s atmosphere in September 2017. “It would have been great to have a few more years! That would have enabled us to continue acquiring measurements throughout the northern hemisphere summer and draw conclusions after half a Saturnian year,” notes Sandrine Guerlet. “But the Cassini mission had already been extended and that’s how we were able to see this second hexagon… So, it’s slightly frustrating, but we’re pleased to have made this major discovery.” Until future missions are sent to Saturn to resolve the enigma, a significant amount of data from Cassini remains to be analysed, while the largest telescopes on Earth are now able to view with increasing sensitivity and precision. 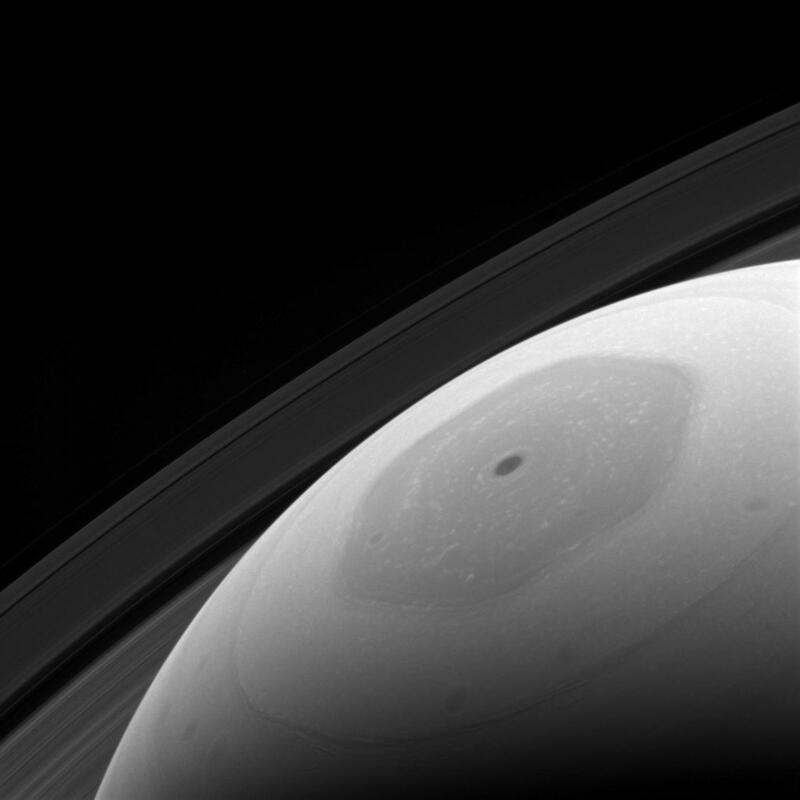 The hexagon is visible in the clouds of Saturn’s North Pole, as seen by Cassini. Credits : NASA/JPL-Caltech/Space Science Institute, 2017.